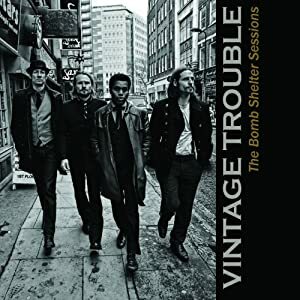 Vintage Trouble is the kind of band that hits me right where I live, writing and performing raucous blend of garage rock and dirty, modern blues bursting with joy and creativity and are touched by the spirit of sweet soul and rhythm and blues they channel into tender ballads. They fit brilliantly alongside some of my more recent musical obsessions like Gary Clark Jr., Michael Kiwanuka, and Lianne La Havas. I'd love them VT if I'd discovered them listening to late night radio or watching MTV at 2 AM on a night I couldn't sleep or was just being an irresponsible slacker. That's not how it happened, though. If there's one thing in this world I love, it's when great music passes through me whether in the form of me sharing my love with someone else or them sharing theirs with me. There's nothing quite like it; I see and feel the light. That feeling may last a few fleeting moments or days and weeks later. Sometimes it feels like it's never going to end. I didn't find VT, they found me. They were given to me, a musical gift, from a friend who knows my language is song. She caught them on Late Night With David Letterman and was amazed at the way frontman Ty Taylor commanded what can be a jaded TV audience in that historic Ed Sullivan and the way they seemed to delight and impress the equally jaded host (you owe it to yourself to check out that video below). She checked out a couple more of their songs and recommended them to me. When I finally took a few minutes to listen to them, I flipped so hard I bought the album twice. I downloaded it from iTunes that day and ordered my copy of the CD from Amazon 10 minutes later. My exuberance may seem irrational to you and I get that. I don't have much in the way of impulse control and sometimes make bad decisions but this time it was all for a higher calling, the celebration of song. You now understand why I'm always (going to be) broke but none of that matters. A friend bestowed this beautiful gift upon me and I'm here to pass that love to all of you; it's the light in motion, and I'm going to let it shine. The Bomb Shelter Sessions is sweaty grooves, easy soul, and great hooks. Hard-charging rockers like "Blues Hand Me Down" and "Total Strangers" are boundless energy that can't be controlled or contained, merely channeled. Taylor, guitarist Nalle Colt, bassist Rick Barrio Dill, and drummer Richard Danielson ride the grooves and hold on for dear life. If you think those songs rock, make sure you check out the James Brown-fueled funk of bonus track "Pelvis Pusher" (and I've got a performance of that for you to see and hear below). The roots of "Jezzebella" are deep, taking inspiration from the Muscle Shoals-kissed Southern rock swagger and sweet sounds of bands like The Allman Brothers Band and their musical progeny. Vintage Trouble catch their breath -- and allow us to do the same -- with ballads that soar without bombast like the brilliant "Nobody Told Me," the stirring "Gracefully," and "Not Alright By Me" (be sure to watch the official video for the beautiful "Nobody Told Me" below). You may not even realize there's something missing in your corner of this third pebble from the sun, but take the same leap of faith I did and let your wick touch the flame so you can hear what's been missing. 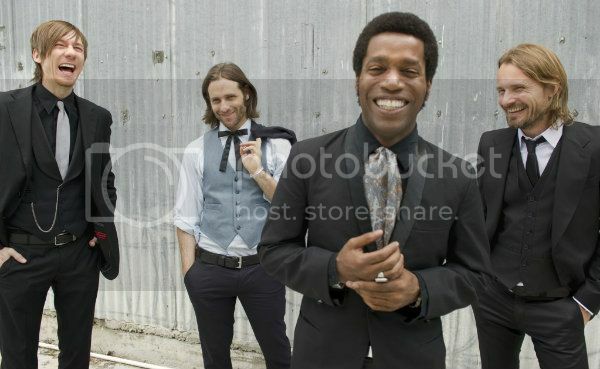 Vintage Trouble is the right band for the moment and life will be better if you let them into yours. I'm lucky to have a friend who shoved me into the fire. Here's your push. Feel the burn of The Bomb Shelter Sessions and rejoice. WARNING: you, too, will be overcome with the urge to pass this musical blessing along. Don't fight it. Let the light shine. 1, 2, 3, push your pelvis with me!